The Enterprise visits the Malurian Star System, previously inhabited by 4 billion life-forms, to find all life destroyed. The starship soon encounters the destroyer of such life, a powerful space probe, Nomad, which believes that its mission is to seek out and “sterilize” imperfect life. When Nomad mistakes Captain Kirk (William Shatner) for its creator or father, scientist and 21st century Earthman Jackson Roykirk, Kirk orders the probe brought aboard the Enterprise for further analysis. The wolf in the fold, however, causes great damage. Nomad wipes Lt. Uhura’s (Nichelle Nichols) memory, and murders Engineer Scott (James Doohan). Fortunately, Lt. Uhura can be re-educated, and Nomad restores Scotty to life. Spock attempts a mind-meld, and learns that Nomad is actually a hybrid, or changeling. At some point after launch from Earth, the device collided with an alien probe, the “other” called Tan-Ru, and assimilated its power, as well as portions of its mission (to sterilize plant samples). It is no secret that Star Trek: The Motion Picture (1979) is often referred to, not entirely positively, as “Where Nomad Has Gone Before” because of its similarities to “The Changeling,” an early second season episode of the original series. Both Nomad and The Motion Picture’s V’Ger are connected with “The Creator,” a personality of some importance. V’Ger believes his Creator is on Earth. Nomad believes, erroneously, that Kirk is his creator, Jackson Roykirk. Both Nomad and V’Ger are also, in some way, hybrids. Following an accident, Nomad fused or joined with “The Other,” an alien probe, Tan Ru, which altered its programming and made it super-powerful. By comparison, V’ger fell into a black hole, emerged on the far side of the galaxy was made part of a giant spaceship by the denizens of a machine planet, in order to fulfill its programming. Both Nomad and V’Ger similarly consider humans (carbon based life forms) to be pesky infestations, not true life forms. And both Nomad and V’ger also communicate at a rate of speed not immediately detectable by the Enterprise. 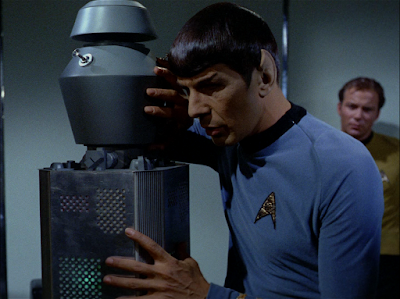 In both adventures, Spock must modify rate of communication for the Enterprise’s friendship messages to be fully understood. His efforts occur as the Enterprise comes under fire from terrifying weaponry, and its shields begin to buckle. Of course, both V’Ger and Nomad possess that incredible destructive power mentioned above, which they wield on their long journey to Earth. Nomad destroys 4 billion lives in the Malurian system. V’Ger destroys three Klingon battle cruisers, and the Epsilon 9 outposts. Lastly, Spock conducts a mind-meld in both “The Changeling” and The Motion Picture, and the information he gleans from it proves crucial in understanding and “defusing” their opponent. The Motion Picture is much better visualized, certainly, and features a visual/thematic subtext of birth, or rebirth. The Enterprise, entering the V’ger cloud and spaceship, is basically the corollary for a sperm moving through the birth canal of a human female. That sperm is delivered (in the person of the Creator; Decker), and a new life-form is born, a hybrid of V’Ger and humanity. This concept is literalized at the end of the film, when McCoy muses upon how it’s been a long time since he “delivered a baby.” But really, The Motion Picture is (beautifully) about the conception of that baby. Notably, the Enterprise/sperm also carries the foibles of humanity/carbon-based life-forms, which turns out to be the very thing V’Ger requires. 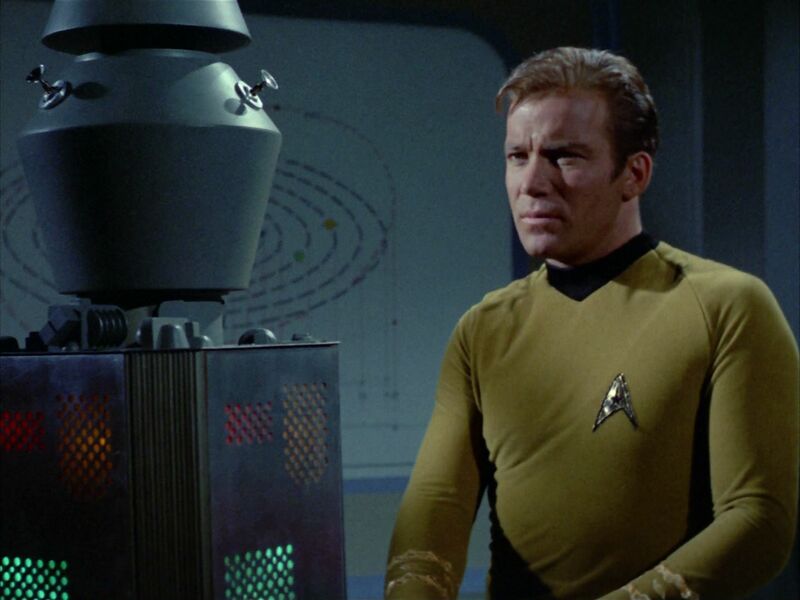 We see Kirk’s obsession with the Enterprise, and the drive to “overcome” it. We see Spock, cold and sterile, after attempting “Kolinahr” (the ritual to purge emotions) beginning his journey to embrace humanity and emotions. Personally, I feel that Star Trek: The Motion Picture, while erected from familiar pieces (namely, the ingredients of “The Changeling”) is nonetheless one of the most beautiful and rewarding science fiction films of the late 1970s. It is also a very fulfilling Star Trek movie because the main characters, particularly Spock, grow in life-altering, humanity-affirming ways. I feel that the visuals and themes involving the Enterprise delivering genetic material, essentially, for the birth of a new life form, is handled in a remarkable fashion. Although lacking that feeling of apotheosis, “The Changeling” is a compelling and ambitious episode in conception, especially considering the nature of Nomad. 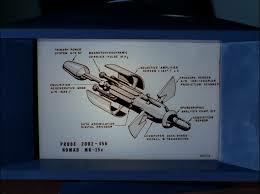 The small probe (parodied to perfection in The Mystery Science Theater 3000 [1989-1999] episode “Laserblast) is not a typical guest star, and I can’t even imagine how difficult this episode must have been to shoot, with the floating Nomad moving and hovering under its own power, through doorways, into turbo-lifts, and so forth. Worse, some of the details of the story, namely Uhura’s re-education, leave much to be desired. Specifically, Lt. Uhura has her mind wiped when Nomad attempts to understand “singing.” McCoy and Chapel (Majel Barrett) attempt to re-educate her. 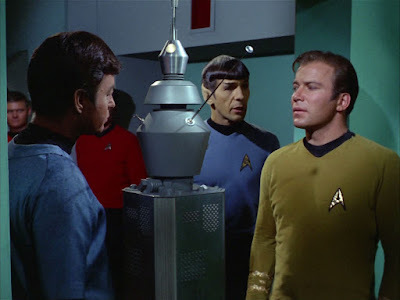 By the following week''s episode, however, Uhura was normal and no one ever brought up the fact that she had to be re-educated in a period of weeks. If Uhura can be back to college level of education in just weeks, why does it take years for students to graduate from the Academy? Here, the scenes with Uhura speaking Swahili and learning to read vacillate between charming and risible, moment to moment. Also, Uhura's subplot involves another "sixties sexist" moment. When Nomad reports that Uhura's brain is a mass of conflicting data, Spock notes that, well, she is a woman. Scotty also gets killed and revived in “The Changeling” making him the second Star Trek character, beyond Mr. Spock, who has really “gone where no man has gone before,” into the undiscovered country (death). I always laugh when long-time fans complain about Khan’s magic blood and how it has cured death in Star Trek: Into Darkness’s (2013) Kelvin universe. “The Changeling” has also conquered death in the prime universe. All you need is a house-call from Dr. Nomad, M.D. 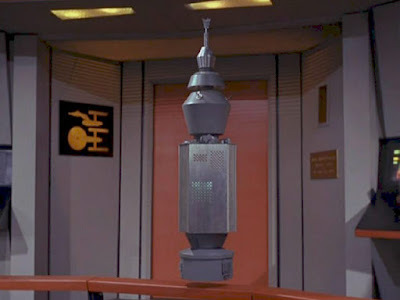 Additionally, it seems vaguely inappropriate, perhaps even obscene, for Kirk to be joking about his son (Nomad) the “doctor” mere hours/days after 4 billion intelligent life-forms have been eradicated in the Malurian System. This is one of those TV stories in which you are expected, at the end of the story, to forget what happened at the beginning of the story. Instead, we just get a pat, happy ending, with Kirk and Spock bantering lightly on the bridge. Of all those episodes, only “The Doomsday Machine” qualifies as a great hour, and that’s because of the human stakes, involving Decker and his feelings of guilt/anger/revenge. Some of those individual episodes are quite good, even classic, and yet one can clearly see that the second season is more formulaic, in a sense, than the first season was. Many of the stand-out episodes of the second season include those that exist outside the formula, notably, presented by those three types: “Amok Time,” “Mirror, Mirror,” “The Deadly Years,” and forth. “The Changeling isn’t a bad episode, and, in fact, I consider it a great “dry run” for the superior The Motion Picture. That Robert Wise film features important character growth for the series’ protagonists, and parallels their development and maturation with V’Ger’s own. “The Changeling” is an imperfect first try at such material. 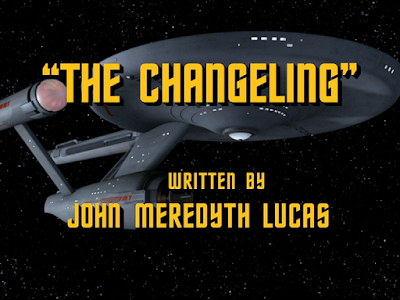 John extremely thoughtful review of “The Changeling", Nomad & V’ger relative to TMP and TOS season two episodes. I like “The Changeling" episode itself, but loved Star Trek:The Motion Picture much more. Recently I picked up and have been reading a book which was published locally by Creature Features Press. It's called Return to Tomorrow - The Filming of Star Trek: The Motion Picture by Preston Neal Jones. Jones was let loose on the sets and fx houses before, during and after filming, and interviews everyone associated with the movie (Roddenberry, Shatner, Nimoy, Wise; all the way down to even Production Assistants!). Originally intended for an article to be published in Cinefex magazine, the deadline was missed due to the fact that the film itself was literally finished the night before its premiere. The interviews have been compiled and organized sequentially to create a log book of the events during all stages of production. Your love for ST:TMP is apparent, and I thought you'd like to check the book out for yourself. The fact that the script was somewhat derivative of The Changeling is addressed, but seemed to boil down to it being the only script that Paramount accepted at the time. Still, a great read so far! Thanks for your thoughts regarding this episode, and the Second Season overall. In addition to man vs machine (Kirk talks computer to death), I always thought of The Changeling more as a what-have-we-wrought story--a version of the common post-atomic story so common in science fiction. Remember, at the time Star Trek was filming, NASA's Mariner probes visiting Mars, Mercury and Venus were launched or launching, and would be until 1971. A prevalent thought at the time among sci-fi writers was, "We sent this thing out there to make contact. What if it does?" Nomad comes back, all right, and it he's no longer benign. This is part of a theme all too rarely examined in science fiction, which generally has been obsessed with the idea that when we encounter aliens, they will be more intelligent and better than we flawed humans are, when in fact they might be worse! H.G. Wells was one of the few to consider this point of view in print much, and here is The Changeling considering it too. What if alien intentions are NOT benign? What if they just want our stuff? What if they don't consider us as anything more than bugs? Thanks for the comparison of this episode to The Doomsday Weapon - I've always found it to be a very compelling episode and you helped me figure out just what it was about it that makes it appeal to me more than The Changeling. Despite the flaws I find that when I take the time to watch Star Trek nowadays it's usually the original show. I loved the Next Generation when it was new and enjoyed re-watching with my fiancee when she decided to watch it recently. (She had never seen the vast majority of the show when new because television time was limited in her family when she was a child) Still, it's the old one that really gets to me. Having not watched the entire series in sequence for almost 40 years, it's enlightening to do so vicariously through your weekly reviews. I've always said that I preferred the second season over the first but could not articulate why. 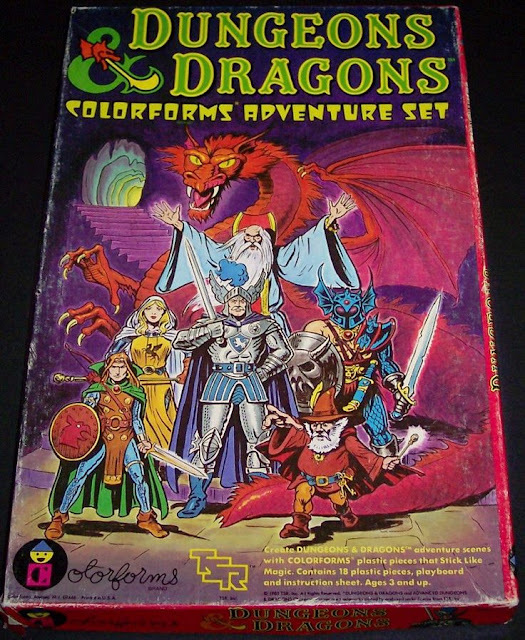 Also, I knew in the back of my mind that there was something about season one that was lacking in the subsequent seasons. Reading these reviews, it's becoming more clear. Season two felt more polished because the cast and crew were more familiar with the characters and themes of the show, but that does lend itself to becoming formulaic. I also enjoy your insights into ST:TMP. I too have been one of those who must defend my enjoyment of the film. It's a beautiful film, not the rollicking romp the later movies became. Yes, it's deadly slow, but as you pointed out, it revisits a common Star Trek theme and gives it a more mature treatment. Also, Robert Wise squeezed out the most nuanced performances from the actors we ever saw on the movie screen.